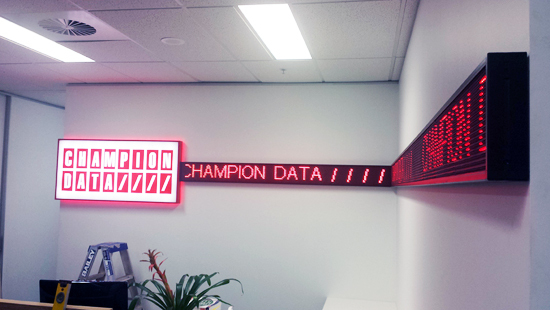 Champion Data was established in 1995 and commenced operations from 1996 in Australian Rules Football, adopting and developing the pinnacle of professional calling standards for the collection of scores and statistics. 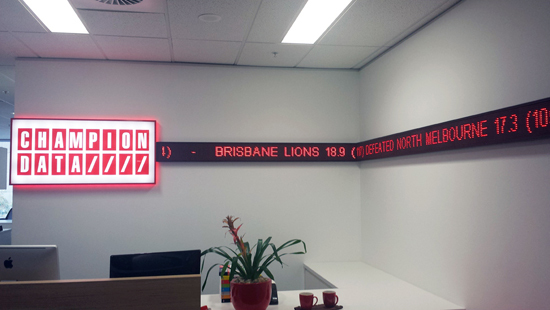 This customer wanted an LED sign that would be able to display the live AFL score in the front office.Our solution to this was simply a 7m single RED color LED Sign with 90 degree conner and 160mm high display. It can be see 3 - 20m away, The sign can download the data from a default URL and upload to the sign every minute, With the our customised web base control interface, customer can control thought Web page, and allowed them to change the font, size, speed, brightness anytime. 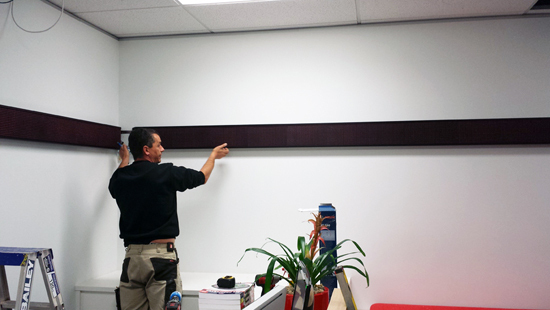 The reason we chose the 10mm pitch red color led sign over the other pitches and colors were because the message needed to be seen for a close distance without losing its clarity.